In a sense, Belmont might have Loyola (Ill.) to thank for its berth in the First Four on Tuesday night. The Ramblers' run from an 11th seed to the Final Four last March is the kind of Cinderella story that makes the NCAA Tournament appointment TV for three weeks every year. It also led to an outcry from some in college basketball who wondered why the selection committee continued to entertain its fetish for ninth place teams from Power 5 leagues over deserving mid-majors. Catch coverage of No. 11 Belmont vs. No. 11 Temple beginning at approximately 9:10 p.m. ET / 6:10 p.m. PT on TSN1 and streaming on TSN.ca and TSN Direct. Seven mid-majors received at-large berths this year, including the Bruins. They will try their luck with Temple Tuesday night at UD Arena in Dayton, Ohio, in a battle of 11 seeds in the East Region. It will be the eighth NCAA Tournament appearance for Belmont (26-5), but its first with an at-large bid. It's the first at-large bid for an Ohio Valley Conference team in 32 years. The announcement brought veteran coach Rick Byrd to tears. "I'm emotional right now," he said to The Tennessean in Nashville Sunday. "I get that way about those I care about, and I feel that way about this team. We were hopeful but you never know. This is an unbelievable accomplishment for this team and this program. "There's been pressure, or a lot of talk, about the mid-majors not getting a fair shake. Maybe it's just human nature that they're tired of hearing people criticize them for it and they decided if it's the right thing, we need to get a mid-major in." The Bruins certainly pass the eye test. With 6-8 swingman Dylan Windleraveraging 21.4 points and 10.7 rebounds per game, Belmont enters the game as the second-highest scoring team in Division I behind Gonzaga at 87.4 ppg. It shoots 49.9 percent from the field and averages nearly 20 assists per game. Trying to ruin that feel-good story are the Owls, who have their own version of justice to pursue. The next loss for veteran coach Fran Dunphy will be his last, as he's retiring at season's end. Dunphy will make his 17th NCAA Tournament appearance -- nine at Penn, eight at Temple -- to tie former Owls coach John Chaney for the most by a Big 5 coach. 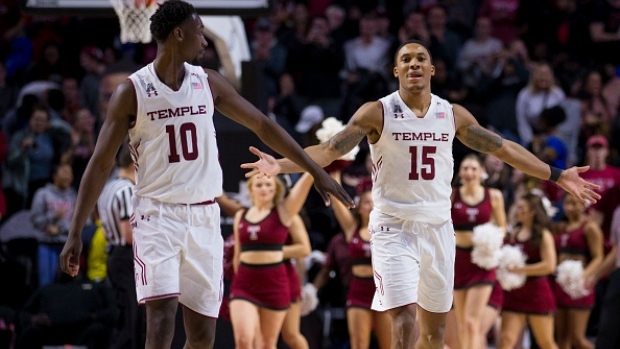 Temple (23-9) is led by American Athletic Conference scoring leader Shizz Alston. Averaging 19.7 ppg, Alston also leads the AAC in free throw percentage (90.7) and minutes per game (37.1) while ranking second in assists per game (5.0). His cool under pressure helped the Owls go 9-2 in games decided by five points or less and 4-0 in overtime contests. "We are a veteran team and have been through those situations a lot in the past couple of years, and that has helped us in close games," Alston said to philly.com. Both teams are coming off disappointing losses in their conference tournaments. Belmont fell 77-65 to Ja Morant and Murray State in the OVC finals on March 9, while Temple was upset Friday night by Wichita State 80-74 in the AAC quarterfinals. The winner flies to Jacksonville for a Thursday date with No. 6 seed Maryland.